Many thanks to Larry Lewis of Osceola for arranging our presentation to the St. Clair County Historical Society last week. 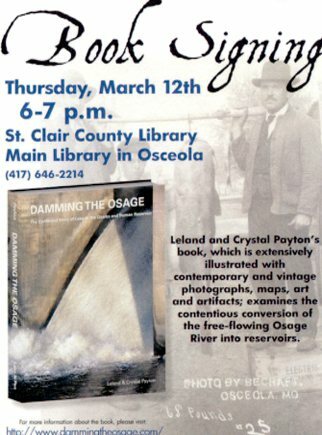 With Larry’s recommendation and the support of Angie Jones, Director of the St. Clair County Library, we were invited to discuss Damming the Osage with the members of the Historical Society. The town of Osceola and much of St. Clair County were deeply affected by the changes brought on by the construction of Truman Dam and Reservoir. Leland was a plaintiff in the lawsuit filed by the Environmental Defense Fund (1972) to stop or reduce the size and impact of the dam. It was a position that put him (then) at odds with many people in at least three, maybe four counties. Feelings were strong during the lawsuit. People took sides with strong opinions. We were curious to see what the reaction was to our description of events. The gathering was cordial and the audience knowledgeable about the events and issues. Indeed, we learned a lot from them. Personal stories of life on the Osage River pre-dam, paddlefish season, the Civil War and its aftermath, outlaws and their final resting places, and meteors (that’s another post!) were lively, informative and added an intimate perspective on the costs and consequences of such huge and intrusive projects. We showed our book video and one titled Osceola’s Lament evoking the after-dam realization that reality doesn’t begin to meet the optimistic promises of the dam-builders and promoters. Sadly, many of the negative consequences predicted by that lawsuit seem to have come to pass. Today, many residents are unenthusiastic about the monstrous and shallow reservoir that destroyed so much of the history and natural resources of the area. Angie Jones, Director of the St. Clair County Library, requested an autographed copy for a patron.